I have an interest in banned books. I don’t always like them (example anything by Norman Mailer) but I like to read them all the same. But then again nearly any book that’s any good has been banned at some point as ones that were just silly (Captain Underpants the comic was banned, as was Harry Potter and the Lord of the Rings). The America Library Association has lists of banned books that I found very interesting especially as this still goes on over in America. (One of my favourite people John Green had his book Looking for Alaska banned in a school in Mississippi) For these reasons I’m doing a series of reviews of banned books over the holidays. Fahrenheit 451 is luckily not only a banned book but a very good book. It’s the quintessential banned book, ironically about book burning and written in the wake of the Second World War where authoritarian regimes and censorship were so burned into the public imagination. Fahrenheit has been banned several times, starting mostly in the conservative era of McCarthyism in America during the cold war, for having “questionable themes”. One of the obvious main themes is the importance of freedom of expression which was something McCarthyism threatened. 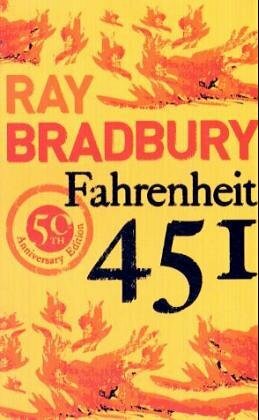 Like opposition to 1984, the opposition to Fahrenheit 451 stemmed from the disturbing similarities between the society in the novel and our own. A world of instant gratification and self-centred entertainment is an unpleasant parallel to trends that can be seen today. Bradbury always highlighted the importance of intellectual protection as a aspect of the story. Ray Bradbury passed away this year. He was a hugely prolific writer though this was his most famous novel. Fahrenheit 451 is a dystopian classic set in the ‘not-so distant’ future where books are illegal, intellectualism is criminal and the world is dribbling at the TV screen walls. It tell the story of Montag, a “fireman” who is responsible for burning books and houses containing books and Clarisse, a seventeen year old girl from an intellectual family who causes him to start THINKING. It’s incredibly stylised and metaphorical while still retaining a simple plot of a man shaking himself loose from the indoctrination of his generation. Some critics of the book claim that its third section is overly stylised and the symbolism of the mirror factory is forced at the end but I think its suits the almost dream-like quality of the book. Montag is waking up from his comatose society and frequently he has difficulty remembering anything. The narrative itself is depicted in a fantastic, vague way as Montag himself is trying to see clearly. My strongest feeling when I finished this book was regret. Regret that it was over and regret that I had waited so long to read it. In some ways I was Clarisse growing up in a world less dangerous than hers. My family, too, influenced me to be different from my peers for better or worse. I will build a mirror factory. I will build it and through it I will see the world. If, as Sherlock Holmes once said, you could infer Niagaras and Pacifics from a drop of water than from a single reflected human being you could infer the species. I really liked Clarrisse in the story, the way she acted convicted me about who am I focusing on when I’m talking with people. I only wish her role wasn’t cut so short. It’s also funny to see the qualities that people in my school that Clarrisse exhibits. The first time I read it I spent most of the book waiting for Clarrisse to come back somehow but on subsequent reads I saw how the way that she’s only there for a short time, almost like a dream, is important for the rest of the story.